There appears to have been a school of Gnostics known as “Melchizedekians,” who revered Melchizedek as an avatar of Seth (third son of Adam) and Shem (second son of Noah, progenitor of the Semitic peoples). A gnostic tractate included in the Nag Hammadi Library bears the name of Melchizedek. This tractate elaborates on the role of Melchizedek as eschatological high priest, messianic warrior, and previous incarnation of Jesus Christ. The name Melchizedek (מַלְכִּי־צֶדֶֿק) can be translated as “Righteous King” or “My King is Justice.” Melchizedek was the “king of Salem,” and “Salem” was probably Uru-Salim, an old name of Jerusalem, whose king during the Israelite invasion of Canaan had the strikingly similar name of Adonizedek. 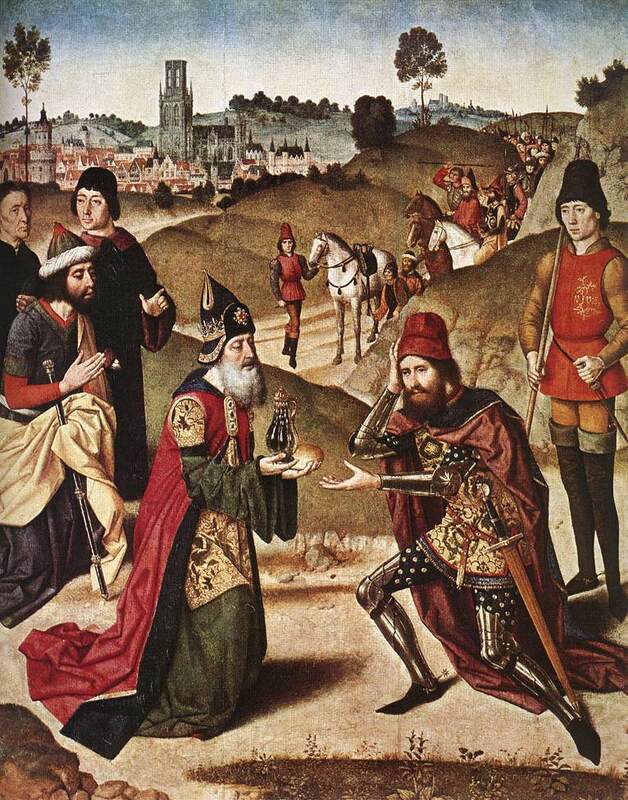 As the priest of Abraham, Melchizedek can be considered the progenitor of the Abrahamic religions– Judaism, Christianity, Islam and their derivatives. Based in Genesis 14:18, he is sometimes credited with having substituted the sacrifice of bread and wine for that of animals. Many sacerdotal lineages, including the Roman Catholic, Mormon and Masonic Royal Arch, are traced in legend to Melchizedek. Aside from historical questions, the Hebrew word salem, שׁלם, means “peace”; thus “Melchizedek king of Salem” could be interpreted “King of Righteousness, King of Peace.” The Hebrew word zedek, צדק, “justice” or “righteousness,” is also the name of the planet Jupiter. Thus, in a Qabalistic sense, Melchizedek, the jovian priest-king of righteousness and peace, is the embodiment of the divine image of the sephirah Chesed. A “priest forever after the order of Melchizedek” would thus be a fitting description for an Adeptus Exemptus.